This section is for the other textile things I’m interested in — spinning, weaving, braids of every description, and occasional knitting, crochet and sewing. 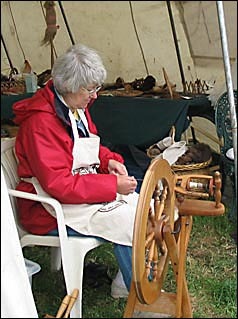 I first became interested in spinning over twenty years ago when a friend of my aunt's gave me some fleece from her small flock of Soay sheep. I taught myself to spin with a spindle and then bought a spinning wheel which I struggled with for a while — treadling and doing things with my hands at the same time didn't come naturally! Eventually I did manage to produce some reasonable yarn which I used together with other wool yarns in woven floor rugs. I also did some finer patterned weaving for scarves, table mats and waistcoats — at the time there was a wonderful Arts Centre in Glasgow where I could use both floor and table looms. I didn’t find time for spinning and weaving while I was busy with the Lace Guild committee but I’ve now dusted down and oiled my spinning wheel and got going again as you can see from the picture. I still have a table loom waiting to be put into working order again but in the meantime I have been enjoying myself discovering all sorts of different braids from all over the world. I particularly like the ones you can make in your hand without fancy equipment and I like to have some of these on the go when I'm traveling to while away tedious waits. Peruvian Braids made with rug yarn following instructions in Sling Braids of the Andes by Adele Cahlander. No equipment is needed — the threads are held and manipulated in your hand.